Weight loss is not the only thing that motivates people to change the way they eat. If you or someone you know is following a vegan or gluten-free diet, or doing a dietary cleanse (such as those recommended for folks dealing with yeast overgrowth or digestive issues) the ideas below may just help make life a little sweeter. But before I share some special-diet favorite foods, let me give a brief background of these special diets and why they have become increasingly popular. This is an eating style close to my heart. I was a strict vegan (read labels, avoided all animal products including dairy products and insect products like honey) for more than seven years and the transition from my super-processed childhood diet to veganism dramatically improved my health. Vegan diets are associated with many positive health outcomes, such as reduced hypertension, heart disease, cancer, obesity, and more. I do feel it is important to note, however, that not all of these health benefits are necessarily directly caused by the vegan diet. When I became vegan, I had to cook for myself much more because most restaurants don’t offer good vegan options. Also, when you take out animal products, plant products such as fruits, vegetables, and whole grains, often fill much of the gap. Since cooking and eating at home and increasing your produce intake are all associated with the same positive health outcomes, it could be largely these “side effects” of veganism that offer the greatest health benefit. The only downside of veganism that I have found is that it can lead some folks to replace simple whole foods with more processed ones, like cutting out butter (made from just cream) and replacing it with a soy margarine (made with more than 20 ingredients, many of which are quite unnatural). But for a vegan eating mostly whole foods, it can be an excellent lifestyle choice. This has become a buzzword as of late, due to the discovery of a digestive condition labeled Celiac disease that prevents certain individuals from being able to effectively digest wheat products. The long-term impacts of untreated Celiac can include an inability for the body to absorb nutrients from many foods and can even lead to malnourishment. As the body of research on wheat expands, there have been additional findings that the centuries of human meddling with the wheat plant has dramatically changed the plant’s composition and rendered it less-than-ideal for consumption by many groups of humans. This does not mean that everyone needs to stop eating wheat, but it has been the “missing piece” for many folks who could not get to the bottom of their health conditions. For people who are even mildly gluten-intolerant, adopting a gluten-free diet often provides many positive outcomes. This amazing company, the Field Roast Grain Meat Co., makes delicious meat substitutes like holiday roasts and seasoned sausages out of fruits, veggies, and grains (including wheat, so GF folks must steer clear). The holiday roasts are a great option for vegans at Thanksgiving and other feasts, and the sausages are a very tasty and convenient option for lots of vegetarian/vegan recipes. I break up the Italian sausages to put in pasta sauce for spaghetti, lasagna, or eggplant parmigiana. You can also just slice the Italian or Sage Apple sausage and sauté in olive oil as a breakfast protein. 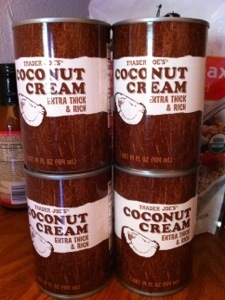 Trader Joe’s coconut cream is like a concentrated version of their coconut milk. It’s so fatty and rich; it’s an amazingly satisfying substitute for butter and cream. I stir it into coffee and tea and spread it on toast. Coconut is an amazing plant because it’s got tons of fat but is actually extremely good for you! The richness will keep you feeling satiated and help stave off sugar and carb cravings. Vegans and GF folks alike love a good sauce. There are few better ways to add flavor and comfort to a healthy meal. Spaghetti squash is a wonderful option to replace pasta. Just slice it in half, remove seeds and strings, salt it, and bake it in a dish with a little water for about 30 minutes at 350. When the flesh is soft, you can use a fork to scrape out the spaghetti-like strands of delicious squashy goodness. I toss mine in a little more salt and pepper and olive oil or butter before I top them with my sauce. You can also julienne other veggies in a food processor to replace noodles or rice in other recipes. I like using zucchini and carrots. Don’t forget the salt; it makes pasta taste great, so why not do your veg the same favor? 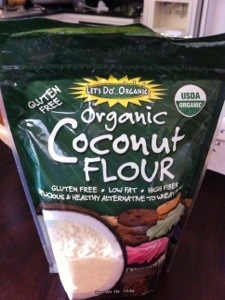 This flour made from coconut flesh can be mixed with other great ingredients like flax meal to create delicious baked goods. You may need to experiment with your proportions to get the right mix of eggs, baking powder, etc, but it’s possible to create lovely muffins and pancakes that will leave you eating GF with great joy! Almond Butter and Apple Chips! Almond and apples are both amazingly nutritious foods. And the healthy fats and naturally-occurring sugars make them wonderful for people trying to stick to their healthy diet without temptation. 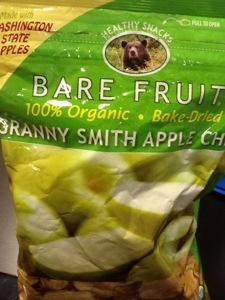 I buy my almond butter at Trader Joe’s and these amazing Bare Fruit organic apple chips at Costco.